Approaching the Museum of Craft and Folk Art on Yerba Buena Lane on Thursday, you could hear the soft sounds of ukulele music from at least 15 musicians (most in Hawaiian shirts), jammed into a corner of the museum entryway, strumming together and singing “In a Canoe” in soft harmony. Inside was “Evolution of the Ukulele: The History of Hawaii’s ‘Jumping Flea,’ ” with displays of rows of handmade instruments and ukulele-themed antique sheet music. 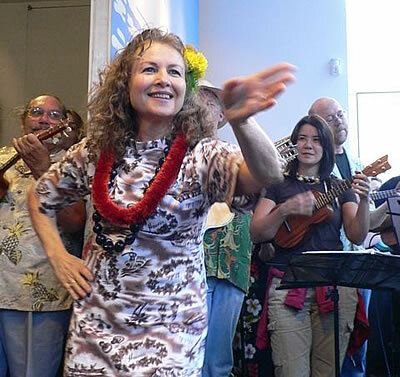 Lynn Roth did a hula as the band played another song, and when they crooned “… never more, say good-bye … ” you could close your eyes and see water lapping at the shore, palm fronds rippling. I stepped into the Lane, relishing the evocation of serenity. And directly in front of the entrance, police were interviewing a distraught woman whose purse had just been grabbed by three teen-agers. Chased by several passers-by, the bad guys had dropped her handbag, so she had it back. Officers were still roaming the neighborhood looking for the thieves. Inside, strummers strummed on. Visit www.mocfa.org for more information and to view other Ukulele events. A special thanks to Tim DeLaVega for providing many of the photos used on this website.